Frozen Vodka: Toasting the Sochi Games! Wanting to write a blog post on Russian food in honor of the Sochi Olympic Games, I weighed making borscht or frozen vodka….Hummmm…Being we’re celebrating the games, the frozen vodka won out. Russia has the highest consumption of vodka in the world and they enjoy vodka, neat. Neat vodka is best served icy cold. Choose a fifth size of bottle(my Absolut vodka is actually Swedish, but it’s what I had!). Rinse out a half gallon milk or juice container and cut it at the fold. I used a clear plastic bottle for illustration purposes. 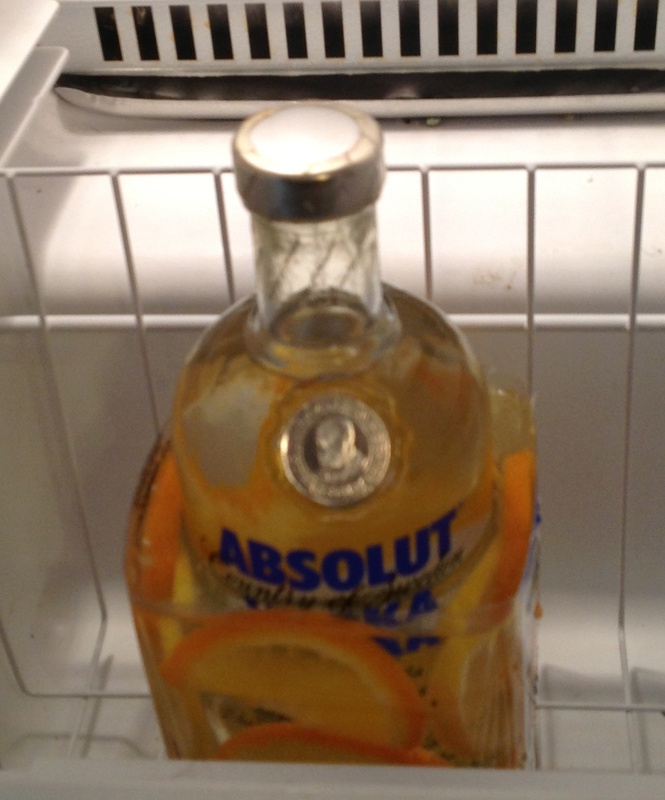 Empty a shelf space in your freezer tall enough to accomodate the bottle of vodka. Choose what you want to decorate the ice ring with. Good choices include citrus slices, small flowers, herbs, sprigs of evergreen, fresh cranberries. I used lemon and orange slices. 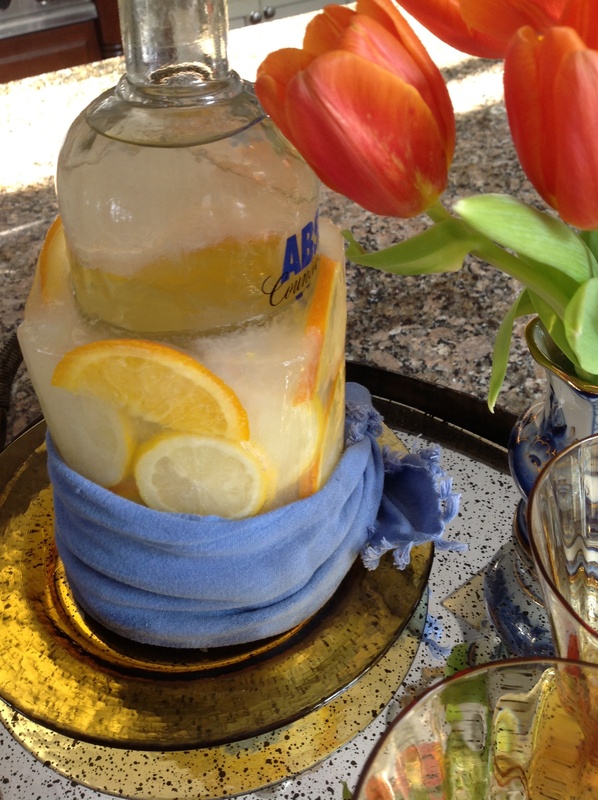 Place your bottle in the container, add the decorations, fill with water and freeze. 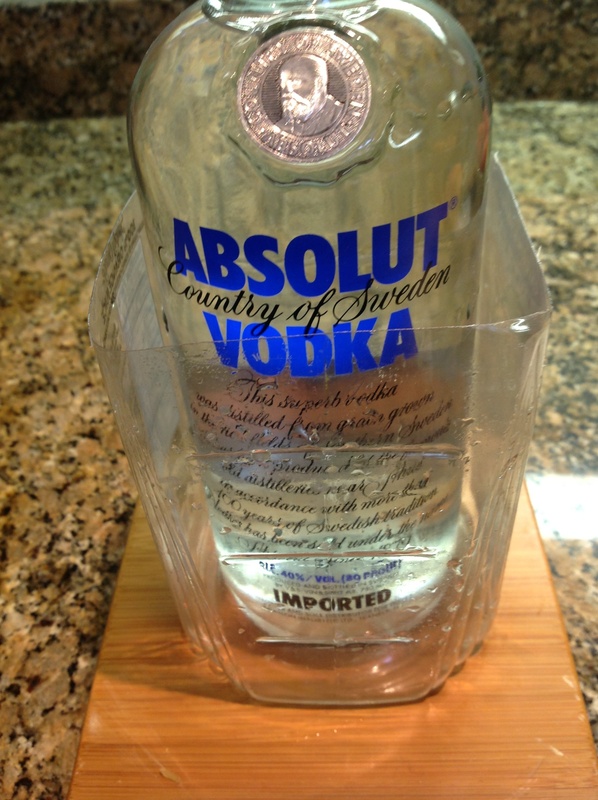 To serve, cut away the cardboard or pastic, then place your bottle on your bar, in a dish, to catch the melting water. If your ice ring extends to the neck of your bottle, you’ll want to tie a napkin around your bottle to pick it up comfortably. My bottle had plenty of non-iced area to comfortably hold on to the bottle to pour. The ice will last about 4 hours at room temperature and will get progressively clearer as it sits out. The water can be tinted with food coloring to tie into a theme. 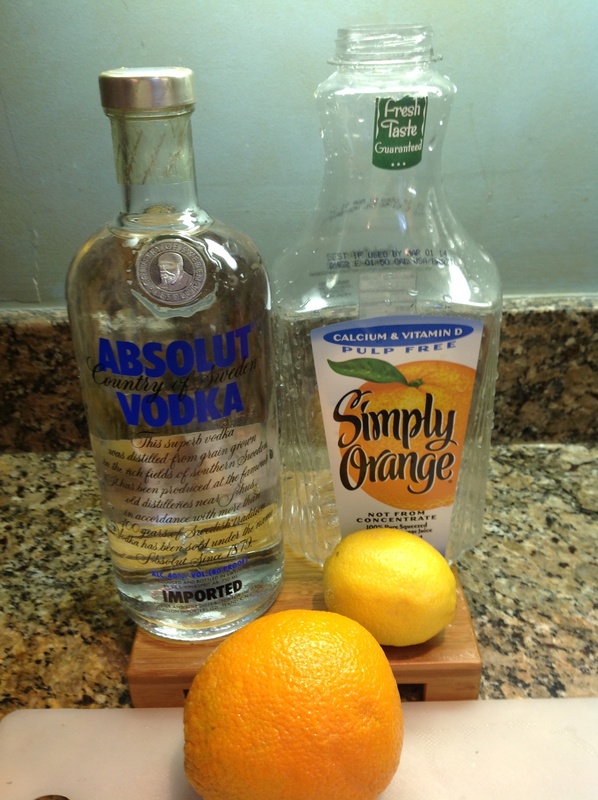 Or you can make a trio of frozen vodka for a spectacular addition to your bar if using different flavored vodkas. While making this project some of the decorations may float up and it will be a trial and error process for how best to proceed. For example if you want to use fresh cranberries, they will float, so put them in first, then layer in citrus slices above to prevent the cranberries from bobbing up. Conversely, you can use the 1/3 method: Place decorations and add water to a 1/3 depth and freeze this. Repeat 2 more times until you have the desired decorations in your ice ring, and the ice reaches the neck of the bottle. Obviously this is more time consuming and I feel, not worth the fuss. This is a really fun project that will be a hit at your party. You can adapt it for non-alcoholic beverages easily. But back to the XXII Olympiad: Raise an icy cold glass of vodka and “toct” the host country of the XXII games: “Za zda-ROV’-ye! ” To health! 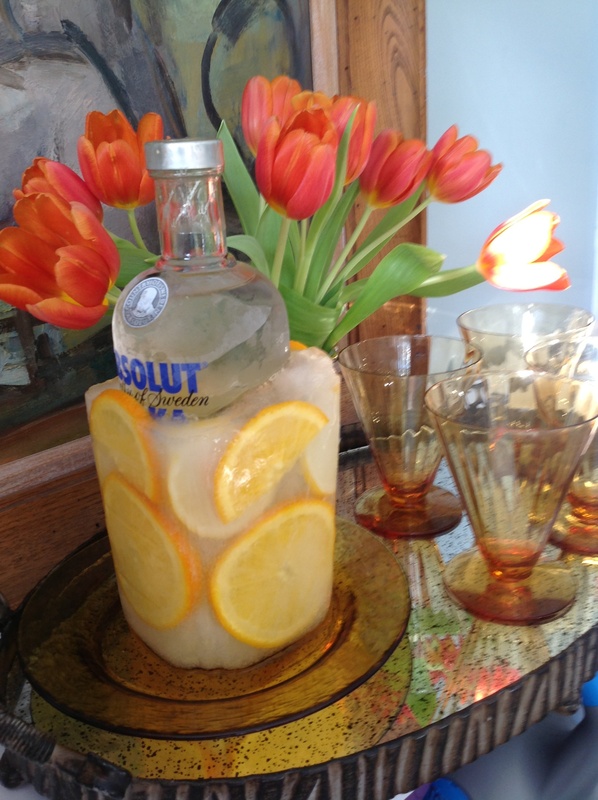 This entry was posted in Entertaining and tagged Bar, bar set up, decorating a vodka bottle, vodka bottle encased in ice by Johanne Lamarche. Bookmark the permalink. So festive! I like my vodka ice, ice cold! Have you made one of these before? You can put the bottle back in the freezer for many weeks with the ice ring as it gets drunk. Aaw, that’s the cutest alcohol I’ve ever seen! 🙂 I think next time you should make Borscht too. It’s probably one of my all time favorites! 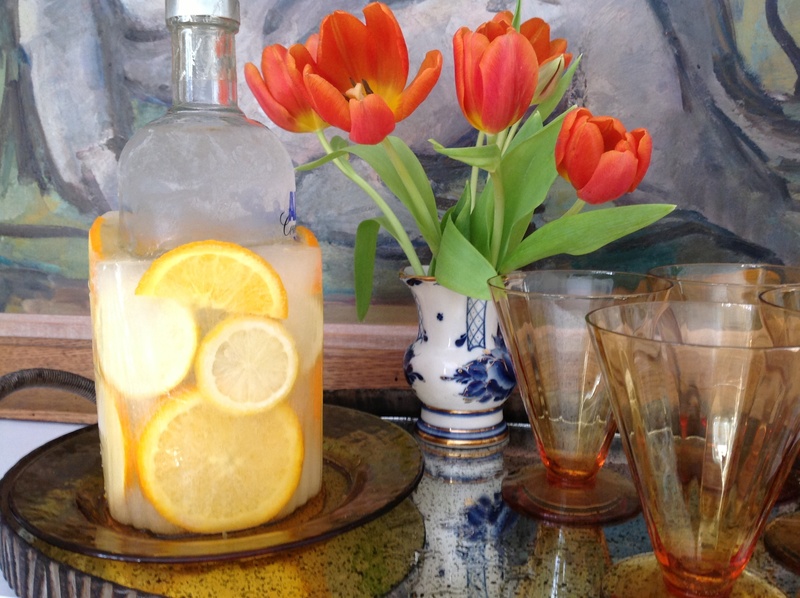 Vodka is my libation of choice whether it’s to toast the Olympics or just the fact that it’s a day that ends with the word “day.” 🙂 This is a really fascinating way to serve it up beautifully to guests or just for yourself…because you’re worth it, right? I’m catching a definite “love of tulips” vibe from you. Love it! These are as beautiful as the purple ones on your Mardi Gras setting! 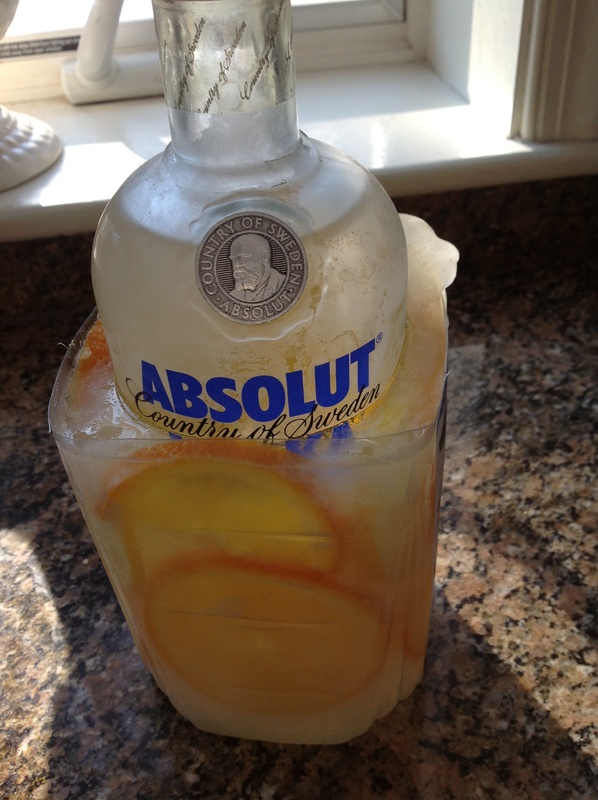 Hi, wanted to ask if its possible to buy that Absolut bottle showed in the pictures? I’m an absolut bottle collector and would be interested in that bottle. If there is a chance to get it please contact me.